Born in 1983 in Gyumri, Armenia, currently lives in Yerevan. Attended courses of sculpture and graphics in Gyumri branch of Fine Arts Academy and painting courses of Fine Arts Academy in Yerevan. Peto works in watercolor without any mixed media, he combines dry brush with wet watercolor surface. Peto works both at location and at studio. Cityscapes made at studio are mainly done from his own photographs and excitedly worked out. Peto focused on cityscape, trying to find and analyze focal points of the city. Peto has hold six One man shows in the country, among them exhibition at Falk Art Museum, Yerevan and United Nations Office in Yerevan, Armenia. 2012 Shanghai International Watercolor Biennial. 2012 Armenia-Japan Art Exhibition,the gallery Ginza 1-Chome, Tokyo. 2013 “Outstanding Watercolor” award –BoldBrushPainting Competition, 2013 June. 2013 “ Synthesis” International Art Competition, Third place award, Lark Gallery Online, Mkrtchyan Art Gallery, CA. 2013-2014 Shenzhen International Watercolor Biennial. 2014 “ Finalist” - BoldBrush International Competition, 2014 January. 2014 World Watermedia Exposition Thailand, Bangkok. 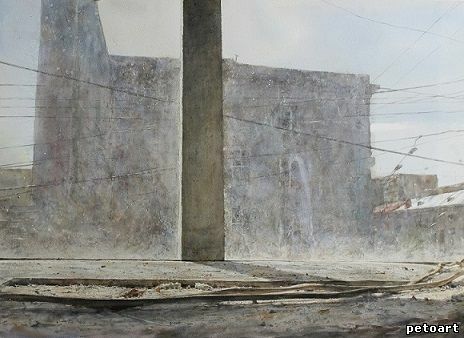 His watercolors are in private collections not only in Armenia, but also in Lebanon, Iran, France, Germany, England, Belgium, Switzerland, USA, Argentine. Corporate collections-American University of Armenia. Armenian embassy in China.